This years summer workshop will be held from the 21nd July to the 26th July 2018. Over the years, CSYM has organised a number of successful summer workshops, with Stephen Power as Musical Director. Generally, they take place in late July, early in the school summer holiday, in the wonderful West Road Concert Hall, in conjunction with rooms in the Music Faculty at the University or at nearby King’s College School. The workshops provide a four-day immersion in the world of piano and musicianship studies, offering an opportunity for extended musical activities and challenges that don’t ordinarily exist within the framework of the weekly programme. Parents and children have a chance to focus on music for four days, to benefit from the teaching of a world-class faculty, to observe and listen to others in classes and concerts, and to enjoy each other’s company. The workshops offer an enjoyable focus and reward for the year’s work, and pupils and parents generally come away feeling proud and energised. One memorable workshop in 2007 focused on a piece entitled Uncertain written especially for CSYM by the workshop’s composer-in-residence, Graham Fitkin. Find out more about the piece and Graham’s role at the workshop. 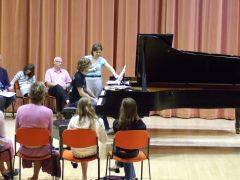 Workshop participants were also lucky enough to either observe or participate in renowned pianist Kathryn Stott’s masterclasses, and attend her excellent recital. Besides Graham and Kathryn, the international faculty included: Hannah Biss, Caroline Gowers, Betty Power, Koen Rens and Jacqueline Vann. In 2006, the faculty included Bruce Anderson, Hannah Biss, Betty Power and Jacqueline Vann, with Huw Watkins as visiting composer. To find out more about the workshops, see the detailed reports by clicking on the links.